This year, Stone Brewing Company celebrates their 13th year of serving up world-class craft beer. In that time, they've grown into the 18th largest craft brewery in the nation, which is no small accomplishment. To mark the occasion, they brew up an anniversary beer each year. This is the first time we've seen a Stone anniversary brew here in Houston, and I couldn't be happier to finally get in on the party. Stone describe 13th Anniversary as an Imperial Red Ale, though I've listed it as an American Strong Ale. It took them three iterations to get the beer to the level demanded of a Stone anniversary release. The brewery claim this is the hoppiest beer in their history, with more pounds of hops per barrel (4.5 lbs. to be exact) than anything they've ever released. Chinook hops are used during brewing, and the beer is dry-hopped with a 50/50 blend of Simcoe and Centennial varieties. It's dry-hopped again just before packaging, making this the first double dry-hopped Stone beer available in a bottle. The backbone is built with pale, crystal and amber malts with just "a touch" of chocolate. Stone intend you to enjoy this beer fresh, and have marked the bottle "do not cellar, enjoy in 2009." I recommend you follow their advice, though I'm still going to age a few bottles, just for the hell of it. Appearance: An exceedingly dark brown body with just the barest red highlights. Up top, three tannish fingers of head featuring great retention and fantastic lacing. Aroma: A pungent blast of piney, resiny hops on top of a rich caramel malt base. Based on aroma alone, I'd mark this as a Double IPA every time. Taste: Up front, a brawny and bitter hop character composed of herbal, pine, citrus, and resin components. Underneath, there's a substantial toasty caramel malt backbone keeping things pretty balanced. There is plenty of spicy alcohol throughout, but the bulk is masked well. It all ends up somewhere in the Imperial Red/Double IPA/American Strong Ale region. The aftertaste is resiny as all hell and lasts well into your next gulp. Mouthfeel: Medium bodied and creamy with good carbonation and a dry finish. Drinkability: Slower due to the big hop character and alcohol content, though not quite a sipper. 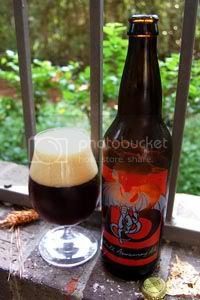 Verdict: Stone 13th Anniversary Ale is a big, brash beer that's brimming with character, which makes it a fitting memorial to 13 great years of Stone brews. Cheers to Greg and the rest of the Stone team! I was lucky enough to have this on tap at the 13th anniversary fest in San Diego this year! Definitely a good addition to the rest of their anniversary beers.